H. Buniatyan Institute of Biochemistry of Armenian National Academy of Sciences, 5/1 P. Sevak Str., Yerevan 0014, Republic of Armenia. ABSTRACT: Misfolding of some proteins, their self-assembly into insoluble amyloid structures underlies many diseases, constituting a group of amyloid-related pathology. Fibrillation of peptide hormone of the pancreas, amylin, is considered as one of the causes of death of β-cells in type 2 diabetes. In this work we studied in-vitro protection of islet β-cells from death in the presence of aggregated amylin by ethanol extracts of rose petals (Rosa damascena), melilot (Melilotus officinalis), leaves of grape (Vitis vinifera), sorrel (Rumex confertus) and blackberry (Rubus caesius), and by eleven fractions, isolated from these plants (Coumarin, phenol glycoside, flavonoid and anthracene derivative). A rather low IC50 values in protection of β-cells were estimated for the extracts (0.03-1.5 µg/ml) and their fractions (0.04-3.9 µg/ml). The inhibition of amylin aggregation by several plant extracts and fractions in-vitro was studied using ThT fluorescence method. 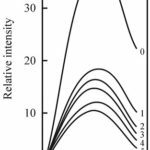 The IC50 values in deceleration of the peptide aggregation were between 1.76-7.24 µg/ml. A strong correlation (r = 0.99, p=0.0005) was observed between IC50 values in the protection of β-cells and amylin aggregation. Probably, both of these processes are conditioned by prevention of amylin aggregation and decomposition of its preformed aggregates by plant preparations. These results allow recommending frequent use of effective plants by persons at risk group and considering these plants as sources for anti-diabetic agents. INTRODUCTION: Misfolding and self-assembly into the insoluble amyloid fibrillar structure of the protein underlie many diseases that make up the group of amyloid-related diseases. Currently, there are not yet found therapeutic agents successfully preventing the formation of fibrillar aggregates, suitable for treatment of amyloid-dependent diseases. Therefore, natural compounds with a broad spectrum of biological activities are considered as sources for developing the new therapeutics 1, 2, 3, 4. Amylin is a secretory product of pancreatic β-cells 5, 6. It is a regulatory peptide functioning in the islet β-cells, where it participates in the regulation of glucose metabolism along with insulin. Amyloid deposits of amylin were found in the islets of β-cells in Type 2 diabetes in humans and some mammals. Aggregated amylin is cytotoxic and is one of the causes of β-cell loss in type 2 diabetes mellitus 7. There is a lot of information concerning the inhibition of amyloidosis of amylin by natural compounds as flavonoids (myricetin, quercetin, kaempferol, etc. ), polyphenols (curcumin, epigallo-catechin gallate, rosmarinic acid, etc.) and others 8, 9, 10, 11. It is believed, these compounds can reduce the cytotoxicity of the peptide on β-cells. Indeed, epigallocatechin gallate in green tea in-vitro inhibited amylin amyloidogenesis and destabilized its preformed aggregates 10. The polyphenols inhibited the formation of fibril aggregates of amyloid proteins and reduced their cytotoxicity 12. Armenia has a rich history in the field of phytotherapy. Some medical plants have been disseminated from here throughout Europe since the V century BC. Herbal medicine developed thanks to medieval Armenian scholars Mkhitar Heratsi, Amirdovlat Amasiatsi, Grigor Magistros and many others 13, 14. Several edible plants widespread in Armenia are used in folk medicine. Their extracts show different pharmacological effects and are used in traditional and current medicine for treatment of various health disorders. Earlier we scanned the effects of the ethanol extracts of leaves of grape, sea buckthorn, and sorrel, rose petals, pellicles of walnut kernels, aboveground parts of melilot and several fractions isolated from them, toward cancerous (mice ehrlich ascites carcinoma), and non-cancer cells (mice peripheral blood leukocytes 15. The significant toxicity to cancer cells and the mild action on the normal cells underlined the potential of several studied plants as sources of anticancer therapeutics. We tested the ability of aqueous extracts of 27 plants of Armenian Highlandto inhi­bit the activities of dipeptidyl peptidase IV and adenosine deaminase enzymes, elevated in diabetes 16. The extracts of several plants effectively inhibited these enzymes. This observation suggests the expediency of a combination of these plants with the usual antidiabetic drugs for enhancing their efficiency. In the present work the effects of ethanol extracts of leaves of sorrel, sea buckthorn, grape, bryonia white roots, thistle seeds, melilot, rose petals, as well as some of their fractions on the viability of pancreatic islet β-cells in the presence of toxic aggregated amylin, are described. We also observed the in-vitro inhibition of amylin aggregation by several plant preparations. The obtained positive effects allow us recommending some of these plants and their constituents as probable sources for developing anti-diabetic therapeutics. General: Thioflavin T (ThT), RPMI-1640 and supplements were purchased from Sigma Ltd, USA; G-25 and LH-20 Sephadex – from Pharmacia Biotech, Uppsala, Sweden, and amylin- from ‘‘Gene Cust’’ (Luxembourg). All the other chemicals were of the highest purity. Spectral measurements were performed on Specord M-40 UV-VIS spectrophotometer (Germany) and spectrofluorometer Perkin-Elmer MPF-44A (USA), using quartz cuvettes with light path 0.5 and 1cm at 25 ºC in thermostatic cuvette holders. The light and fluorescence microscopes model BH- 2RFCA, Olympus, with a digital camera, model c35AD-4, Olympus was used. Plant Material: The roots of bryonia white (Bryonia alba), seeds of thistle (Silybum marianum) and oregano (Origanum vulgare) were purchased from Phytotherapeutic Center "Artemisia" (Armenia). The leaves of grape (Vitis vinifera), sorrel (Rumex confertus) and blackberry (Rubus caesius), rose petals (Rosa damascena) and aerial parts of melilot (Melilotus officinalis) were collected from the flanks of Mount Aragats and dried in the shade. A voucher specimen has been deposited in the herbarium of the Botanical Department of Yerevan State University (Dr. Narine Zaqaryan). The 10% (w/v) extract of dried material in 70% ethanol was prepared and fractionated using gel-filtration on columns with LH-20 and G-25 Sephadex, as described in our previous work 15. The constituents of the extracts and the isolated fractions were characterized by qualitative chemical analysis and thin layer chromatography. Peptide Preparation: To prepare the stock solution of amylin, 0.8 ml of fresh bi distilled water was added to 1 mg peptide and centrifuged after standing for 30min. The absorption spectrum of the supernatant solution was recorded in the range 230-320nm. The molar concentration of the peptide was evaluated using the molar extinction coefficient of tyrosine at 276 nm, 1.39 Mm-1cm-1. The aggregates of amylin were formed incubating the protein for 4-8 days at 37 °C at a concentration of 50-70µM in 20mM phosphate buffer, pH 7.4, containing 0.02% Na azide (w/v). Determination of Aggregation State of Amylin: ThT staining was used as described elsewhere 17, 18. An aliquot of peptide incubation mixture was transferred to the ThT containing a solution, and the resulting fluorescence was measured at λe x= 430 nm and λem = 485 nm (430/485). The fluorescence assay mixture in 260µl of 20mM phosphate buffer, pH7.4, contained 0.14M KCl, 8.6µM ThT, and 8µM pre-aggregated amylin. Isolation of Islet Cells: The experiments involving the laboratory animals were approved by Ethics Committee of Yerevan State Medical University after M. Heratsi, No 7-26.04.2012: Research is not contrary to the Directive 2001/20/EC of The Legal Aspects of Research Ethics and Science in European Community. The mouse pancreatic β-cells were isolated from adult mice pancreas. Collagenase (1.0 mg/ml), dissolved in Hank’s buffered salt solution (HBSS) supplemented with 10 mM HEPES, 10 U/ml penicillin and 0.05 mg/ml streptomycin, was injected into the pancreas through a bile duct. The pancreas was removed and digested for 10-15 min at 37 ºC, dissolved in 10 ml HBSS. Islets were collected by centrifugation, digested to single cells in 0.1% trypsin, and cultured in RPMI 1640, supplemented with 10% FBS and 50 IU/ml penicillin 19. The cells were tested for insulin production after incubation with primary antibodies (anti-insulin mAb) in PBS, supplemented with 4% fetal calf serum, 0.1% sodium azide, and 0.25% Triton X-100, then – with secondary antibodies (IgG conjugated to fluorescein), followed by examining on fluorescence microscope 20. The concentration of cells was adjusted to 5´105/ml and cultivated in poly-D-lysine coated 96-well plates at 37 °С in a humidified 5% СО2 chamber 21. In testing the amylin cytotoxicity, the cultivation medium contained it in the concentration of 8 µM. The Influence of Plant Preparations on the Viability of Islet Cells in the Presence of Aggregated Amylin: To study the influence of plant extracts and isolated fractions on the viability of islet cells in the presence of aggregated amylin, the solutions of plant preparations in 20% ethanol were added to the culture medium up to the definite final concentration. The final concentration of ethanol in the culture medium was <0.1%. The number of viable cells was determined by trypan blue exclusion test 22 and expressed as a percentage of cells in the 0.1% ethanol containing control sample. In the special experiment, it was shown that the ethanol concentrations up to 1% did not influence the viability of cells. Statistical Analysis: The calculation of IC50 values was done using GraFit software. The data, obtained at least in three independent experiments, were analyzed using the software InStat, version 3 for Windows (GraphPad Software, Inc., San Diego, CA, USA). The results were expressed as means± SE. The Influence of Amylin on the Viability of Islet β-cells: To test the toxic effect of amylin on the islet β-cells in culture, the cells were cultivated in the presence of different concentrations of fresh, non-aggregated amylin and amylin aggregated for 72h in the above-described conditions. In Fig. 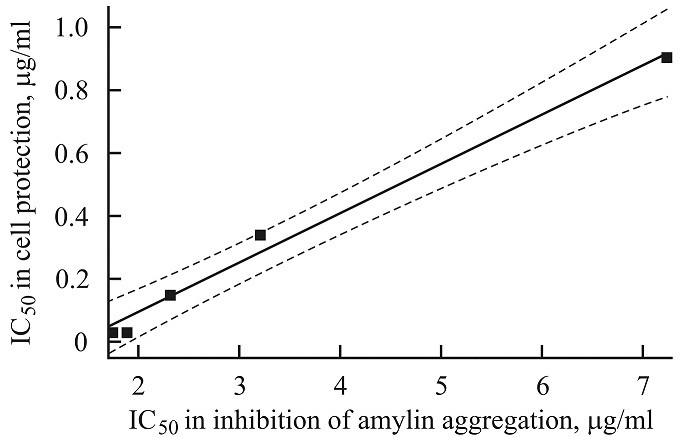 1, the dependencies of the number of living β-cells on the concentration of non-aggregated and aggregated amylin after 3-day cultivation are presented. 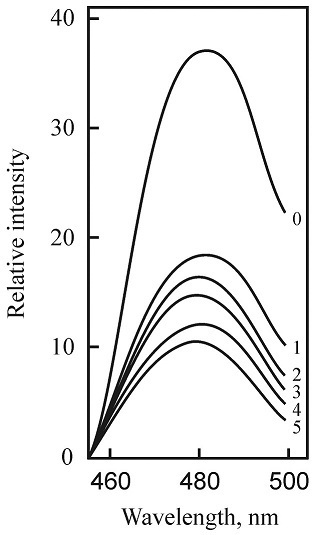 The curves demonstrate the higher toxicity of the aggregated amylin compared with the non-aggregated peptide. The cytotoxicity of aggregated amylin was proved at the cultivation of β-cells in the 8µM aggregated peptide-containing medium. 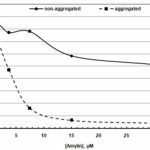 In 9 independent experiments per four repetitions, the number of cells in 0.1% ethanol containing control samples (42.4 × 105 ± 2.6) decreased on average to 16 % in the presence of aggregated amylin (7.1 x105 ± 0.8) (p<0.0001). The influence of Plant Extracts on the Viability of Islet β-cells in-vitro: We studied the possible protection of β-cell viability at cultivation in the presence of aggregated amylin by ethanol extracts of several plants. We first examined the effect of the plant extracts per se on the in-vitro development of cells. The preliminary results (not shown) for three concentrations of the extracts (75, 112.5 and 225 µg/ml) indicated that the extracts of rose petals (RP) and blackberry leaves (BL) promote the growth of cells. At the highest concentration (225 µg/ml), the extracts of melilot (M), grape leaves (GL) and sorrel leaves (SL) hindered the development of cells by 10, 15 and 35% respectively. The extracts of oregano and seeds of milk thistle suppressed the growth of cells significantly and were excluded from the subsequent study. In the future researches, the final concentrations of plant preparations in the cultivation medium were 75 µg/ml and lower. 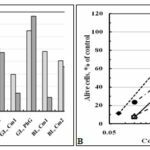 The Influence of Plant Extracts on the Viability of β-cells in the Presence of Aggregated Amylin: In Fig. 2A, the number of living cells, cultivated during three days in the presence of 75µg/ml plant extracts with and without aggregated amylin is expressed as a percentage of the 0.1% ethanol-containing control sample. In the amylin-free medium, the studied plant extracts maintained the development of cells in the level of 100-137% of control. In the aggregated amylin-containing medium the plant extracts demonstrated the ability to save the viability of cells on the level 70-110%. (A) The number of alive cells cultivated in the presence and absence of 8µM aggregated amylin expressed as a percentage of 0.1% ethanol containing control. The concentrations of ethanol extracts of plants were 75 µg/ml. (B) The dependencies of the viability of islet β-cells on the concentration of ethanol extracts of indicated plants, cultivated in the presence of 8µM aggregated amylin. In Fig. 2B, the concentration-dependencies of the influences of plant extracts on the viability of islet cells cultivated in the presence of 8µM aggregated amylin are shown. The extracts of SL and GL in the concentration interval 0.3-15µg/ml protected the cells up to 90-100% of control. The protection by 1.5-15µg/ml of melilot extract was 80-100%. The protective effect of the RP extract was significant only at concentrations above 15 µg/ml. The protecting abilities of all extracts decreased with the decrease of the concentration. The IC50 values of ethanol extracts of plants in the protection of β-cells from killing by aggregated amylin are presented in Table 1. The Influence of Plant Fractions on the Viability of β-cells in the Presence of Aggregated Amylin: The gel-filtration of plant extracts on columns with LH-20 and G-25 Sephadex resulted in the receiving of several fractions, among them: coumarin1 (Cm1) and coumarin2 (Cm2) – from the extracts of BL and RP; Cm1 and two phenol glycoside (PhG) fractions differing by elution volume – from GL, one PhG – from RP; Cm1, anthracene derivatives (AD) and flavonoid-rich (Fl) fractions – from SL, Cm1 fraction from melilot. Kim and colleagues had shown23 that the optical spectrum of coumarin changes with its dimerization. Based on this publication, we named the dimeric; we named the dimeric form of the compound (λmax<300 nm) as Cm1 and its monomer form (λmax= 310 nm) as Cm2. Cm1 and Cm2 fractions, after separation on Sephadex columns, were additionally purified on DE-cellulose column. The influence of some of the obtained fractions at concentration 75µg/ml on the development of islet cells in the presence and absence of 8µM aggregated amylin was screened Fig. 3A. In the amylin-free medium, the most of studied fractions per se did not hinder the development of cells, but Cm1 fraction of GL and Cm2 fraction of BL suppressed the viability of cells by 40 and 20%, respectively. On the contrary, Cm1 fraction of M and PhG fraction of GL increased the number of living cells by ~30 and ~50%, respectively. In the presence of aggregated amylin, almost all the fractions protected the cells from amylin-induced death. The best protection was demonstrated by two PhG fractions of GL and Cm1 fraction of melilot. From this point of view, the worst was Cm1 fractions from BL and GL: the level of the number of living cells remained near the level of the aggregated amylin-containing control sample. The concentration dependencies of β-cell protection from death in the presence of aggregated amylin were studied for several plant fractions. In Fig. 3B, for example, the dependencies for Cm1 fractions from four plant extracts are presented. The IC50 values for plant fractions in the protection of islet β-cells from the toxicity of aggregated amylin are listed in Table 2. 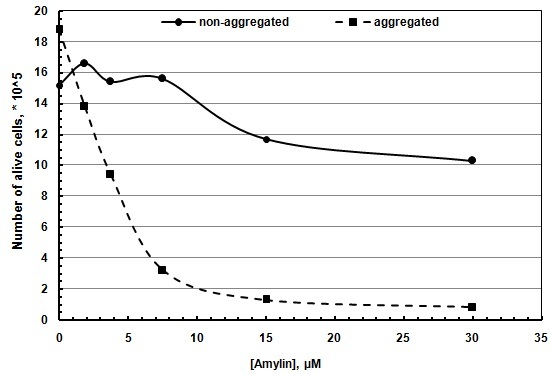 (A) The number of alive cells cultivated in the presence and absence of 8µM aggregated amylin expressed as a percentage of 0.1% ethanol containing control. The concentrations of plant fractions were 75µg/ml. (B) The dependencies of the viability of islet β-cells on the concentration of coumarin fractions of indicated plants, cultivated in the presence of 8µM aggregated amylin. 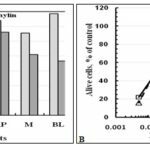 The Influence of Plant Preparations on Aggregation of Amylin: We performed the experiments to evaluate the ability of plant extracts and their fractions to prevent the aggregation of amylin in-vitro. In these experiments, the identical solutions of 50µM peptide were incubated for 7 days at 37oC in the presence and absence of plant preparations. The aliquots of these solutions were added to the ThT-containing mixture, as described in materials and methods, and 430/485 fluorescence intensities were registered. Protein was incubated without any additions (0, a control sample), and in the presence of ethanol extracts of M (1), GL (2) and SL (3), and of plant fractions: Fl from SL (4), PhG from RP (5). The spectra were registered at λexcit. = 430nm and λem. = 485 nm; both slits were 8 nm. In Fig. 4, some examples of obtained spectra are shown. The decrease ThT fluorescence intensities of amylin, incubated in the presence of plant preparations, evidence the inhibition of the aggregation process by natural preparations. We tried to study the concentration dependencies of the influence of plant preparations on the amylin aggregation. Unfortunately, this study was strongly hindered by two peculiarities of plant preparations: 1) some of them were provided with their fluorescence, interfering with ThT 430/485 fluorescence; 2) several plant preparations quenched the ThT 430/485 fluorescence. Both these circumstances limited the application of the well-known ThT-fluorescence technique in the estimation of amylin aggregation state. Therefore preliminary, the entire plant preparations were screened for their fluorescence and for quenching the ThT-fluorescence. Then, in the followed study, the weakly affecting preparations/concentrations were chosen. Based on the obtained results, the study was conducted with the selected plant preparations, preferentially at low concentrations (<10 µg/ml). In some cases, the study was limited by 2-3 points, which did not enable IC50 calculation. Nonetheless, the obtained data, in general, evidenced the positive correlation between the concentration and amylin-aggregation inhibiting ability of plant preparations. In Table 3, the IC50 values in the inhibition of amylin aggregation are presented for a few plant preparations, which allowed the parameter estimation. The comparison of IC50 values in the inhibition of amylin aggregation, and in the protection of β-cells by some plant preparations Table 3 vis Table 1 and 2 indicates the correlation between them (except AD from SL). In Fig. 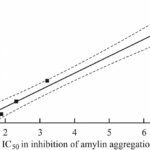 5, the Pearson’s linear correlation curve between IC50 values of two extracts (GL and SL) and of three fractions (RP PhG, SL Fl and RP Cm1) in inhibition of amylin aggregation Table 3 and in the protection of β-cells Table 2 and 3 was shown. The correlation coefficient r = 0.9945 (p=0.0005) manifests the strong relationship between these parameters. It means that the ability of a plant preparation to protect β-cells from aggregated amylin and its ability to prevent aggregation of the peptide is the interdependent properties. We can suggest that their direct action conditions these valuable peculiarities of natural products on the amylin peptide bringing to deceleration of the peptide aggregation and probably to the decomposition of its preformed aggregates. The elucidation of the character of these actions might be a subject of future researches. The higher toxicity of aggregated amylin toward β-cells compared with the non-aggregated peptide was demonstrated. The ethanol extracts of melilot, rose petals, leaves of grape, blackberry, and sorrel, and several isolated from them fractions protected the islet β-cells from toxic action of pre-aggregated amylin. Some studied plant preparations inhibited the amylin aggregation. IC50 values for plant preparations in reducing the amylin aggregation and in the protection of β-cells from killing by aggregated amylin strongly correlate. Apparently, in both of these processes, the direct interaction between amylin and plant preparations is responsible. The obtained results allow recommending: a) frequent use by persons at risk group of plants, effectively decreasing the impact of aggregated amylin on the islet cells; b) considering these plants as sources for developing antidiabetic agents. ACKNOWLEDGEMENT: This work was supported by State Committee of Science of Armenian Ministry of Education and Science, in the frame of the research projects № SCS «11-1f105» and «13-1F186». Carocho M and Ferreira ICFR: A review on antioxidants, prooxidants and related controversy: Natural and synthetic compounds, screening and analysis methodologies and future perspectives. Food and Chemical Toxicology 2013; 51: 15-25. Clardy J and Walsh C: Lessons from natural molecules. Nature 2004; 432: 829-837. Hawkes CA, Ng V and McLaurin JA: Small molecule inhibitors of Aβ-aggregation and neurotoxicity. Drug Development Research 2009; 70: 111-124. Joynera PM and Cichewicz RH: Bringing natural products into the fold - Exploring the therapeutic lead potential of secondary metabolites for the treatment of protein-misfolding related neurodegenerative diseases. Natural Product Reports 2011; 28: 26-47. Westermark P, Wernstedt C, Wilander E, Hayden DW, O’Brien TD and Johnson KH: Amyloid fibrils in human insulinoma and islets of Langerhans of the diabetic cat are derived from a neuropeptide-like protein also present in normal islet cells. Proceedings of National Academy of Sciences USA. 1987; 84: 3881-3885.
Cooper GJS, Leighton B, Dimitriadis GD, Parry-Billings M, Kowalchuk JM, Howland K, Rothbard JB, Willis AC and Reid KBM: Amylin found in amyloid deposits in human type 2 diabetes mellitus may be a hormone that regulates glycogen metabolism in skeletal muscle. Proceedings of National Academy of Sciences USA 1988; 85: 7763-7767. Westermark P, Andersson A and Westermark GT: Islet amyloid polypeptide, islet amyloid, and diabetes mellitus. Physiological Reviews 2011; 91: 795-826. Aarabi MH and Mirhashemi SM: The role of two natural flavonoids on human amylin aggregation. African Journal of Pharmacy and Pharmacology. 2012; 6: 2374-2379. Meng F, Abedini A, Plesner A, Verchere CB and Raleigh DP: The Flavanol (−)-epigallocatechin 3-gallate inhibits amyloid formation by islet amyloid polypeptide, disaggregates amyloid fibrils and protects cultured cells against IAPP induced toxicity. Biochemistry 2010; 49: 8127-8133. Mirhashemi SM and Aarabi MH: Effect of two herbal polyphenol compounds on human amylin amyloid formation and destabilization. Journal of Medicinal Plants Research 2012; 6: 3207-3212. Mirhashemi SM and Aarabi MH: To evaluate likely antiamyloidogenic property of ferulic acid and baicalein against human islet amyloid polypeptide aggregation, in-vitro African Journal of Pharmacy and Pharmacology 2012; 6: 671-676. Porat Y, Abramowitz A and Gazit E: Inhibition of amyloid fibril formation by polyphenols: structural similarity and aromatic interactions as a common inhibition mechanism. Chemical Biology and Drug Design 2006; 67: 27-37. Torosian A: The Armenian medical herbs. Hayastan, Yerevan, Armenia 2006. Vardanian SA: Histiore de la médicine en Arménie. del’antiquité á nosjours. ImpriméparL’ Europenned’ Edition, Paris 1999. Antonyan A, Sharoyan S, Harutyunyan H, Movsisyan N, Sargisova Y, Stepanyan H and Mardanyan S: Cytotoxicity of some edible plants toward ehrlich ascites carcinoma cells. Research Journal of Medicinal Plant 2014; 8: 20-31. Mardanyan S, Sharoyan S, Antonyan A and Zakaryan N: Dipeptidyl peptidase IV and adenosine deaminase inhibition by Armenian plants and antidiabetic drugs. International Journal of Diabetes and Metabolism 2011; 19: 69-74. LeVine H: Thioflavine T interaction with synthetic Alzheimer's disease beta-amyloid peptides: detection of amyloid aggregation in solution. Protein Science 1993; 2: 404-410. Sharoyan S, Antonyan A, Mardanyan S, Harutyunyan H, Movsisyan N, Hovnanyan N and Hovnanyan K: Interaction of dipeptidyl peptidase IV with amyloid peptides. Neurochemistry International 2013; 62: 1048-1054. Skelin M, Rupnik M and Cencič A: Pancreatic beta cell lines and their applications in diabetes mellitus research. ALTEX 2010; 27: 105-113. Ohara-Imaizumi M, Ohtsuka T, Matsushima S, Akimoto Y, Nishiwaki C, Nakamichi Y, Kikuta T, Nagai S, Kawakami H, Watanabe T and Nagamatsu S: ELKS, a protein structurally related to the active zone associated protein CAST, is expressed in pancreatic b cells and functions in insulin exocytosis: interaction of ELKS with exocytotic machinery analyzed by total internal reflection fluorescence microscopy. Molecular Biology of the Cell 2005; 16: 3289-3300. Santerre F, Cook RA, Crisel RMD, Sharp JD, Schmidt RJ, Williams DC and Wilson CP. Insulin synthesis in a clonal cell line of simian virus 40-transformed hamster pancreatic beta cells. Proceedings of National Academy of Sciences USA 1981; 78: 4339-4343. Strober W: Trypan blue exclusion test of cell viability. Current Protocols in Immunology 2001; 21: A.3B.1-A.3B.2. Kim HC, Kreiling S, Greiner A and Hampp N: Two-photon-induced cycloreversion reaction of coumarin photodimers. Chemical Physics Letters 2003; 372: 899- 903. Sharoyan SG, Antonyan AA, Harutyunyan HA and Mardanyan SS: Inhibition of amylin fibril formation and protection of islet β-cells by medicinal plants. Int J Pharmacognosy 2015; 2(5): 234-41. doi link: http://dx.doi.org/10.13040/IJPSR.0975-8232.IJP.2(5).234-41.